Communal violence has been the bane of our society. This violence is generally a part of far reaching communal politics. Communal politics in turn is not done just in the name of one religion, in South Asia; communal politics has been seen in the name of Buddhism (Myanmar, Sri Lanka) Islam (Pakistan, Bangla Desh) and Hinduism (India) in the main. To define communal violence is not that difficult as the rival groups being made to doing violence against each other suffers in the process. People of both involved communities so far were suffering in this dastardly act. The details of the violence differ from country to country. In India lately we saw that the violence could be unleashed against a particular community without the other community getting affected (2014 Dhulia, Maharashtra), prior to this we had seen that in our country the number of victims is much more from the minority community as seen in Gujarat and Mumbai carnages. The violence in Malda poses the basic question, was it a case of communal violence or was it just a criminal act, an anti social violence. To sum up; on 3rd January, Malda witnessed a large Muslim crowd mobilized to protest against the statement against Prophet Mohammad by Kamlesh Tripathi, a Hindu Mahasabha worker, later disowned by the party. His statement was in turn a reaction to the derogatory statement against RSS by UP minister Azam Khan. The size of crowd as estimated by state government was around 30000 and section of media, while the spokespersons of BJP playing the slanging matches on TV shows, the shows mistakenly called debates, put the estimate of the crowd to be 2.5 lakhs! 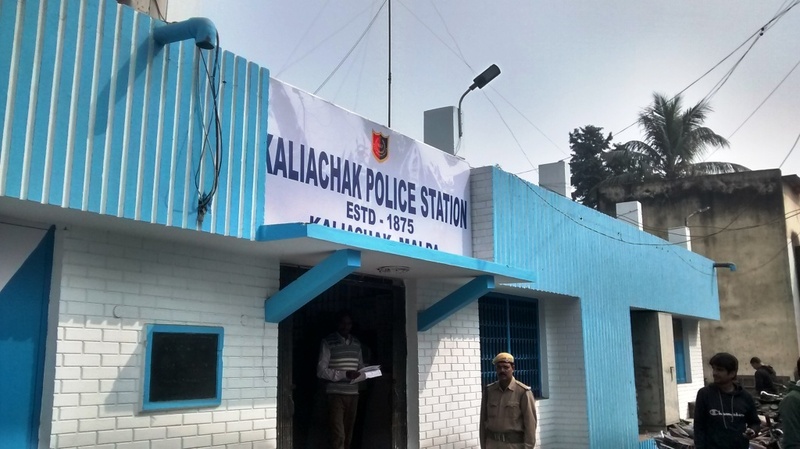 The crowd instigated by some mischievous elements attacked the police station and burned the records related to fake currency notes and smuggling of drugs. No significant injuries took place. No violence against Hindus. Now scholars will have to burn the midnight oil to classify this act of violence; was it a communal violence in any way. The dominating BJP workers and their ideological parents said that it was a pre planned violence meant to frighten the Hindus in the area; who are a minority. Now; three views are prevalent about this tragic incident. Mamata Government is underplaying this just as a law and order problem, related to drugs and fake currency. BJP is shouting from house tops that it is a pre planned conspiracy to dominate the Hindu minority in the area. Congress and CPM are saying that it is a fixed match between Mamata and BJP; who want to reap the electoral benefits from the incident, in an area which so far had been a strong base of Congress party. In a way this also seems to be a case of ‘double polarization’, the phenomenon which was first witnessed in Muzzafarnagar in UP. Mulayam Singh let the events happen so that he can play as the savior to Muslims while BJP and company clearly saw the long term electoral benefits in the violence. In Malda, Mamata Bannerjee’s letting the incident take place and then downplaying it; does look to be aimed to polarize the Muslim community for forthcoming Assembly elections. While BJP presenting it as a communal incident and playing it up in a run up to elections; clearly shows that it is resorting to its usual game of communal polarization. Coming back to whether to call it a communal violence or not? The best comments have come from Association for Protection of Democratic Rights (APDR). Malda Chapter of APDR along with many local residents state that the violence ‘was not communal in nature by a long shot’. APDR comes out with a incisive observation, “when policemen are killed in non-Muslim areas, it is termed ‘lawlessness’ and when a police station is set afire in a Muslim majority district, it is labeled communal” The long term result of this insane violence will be seen in the due course but one can say that it was a test case of analyzing the motives of diverse political players. At another level one observed that as soon as violence took place the major shouting by BJP leaders assisted by social media supplement made the derogatory comments as to how come those who were coming out against Dadri are silent in this case? Where is the ‘award returning’ gang? Why are secularists silent now? Choicest abuses were hurled against those who uphold pluralism and secularism. ‘Why did you not condemn’ cry is not new. Within a day of Godhra train burning 27th February 2002, the then Prime Minister Atal Bihari Vajpayee criticized the minority groups for not criticizing the act enough. The fact even at that time was that most of the minority groups and human rights groups had condemned that incident right away. Which statements draw the popular attention and which fail to do so depend on the projection by the media. When thousands of Maulanas congregate in Delhi and Hyderabad and issue a fatwa that ‘Terrorism is un-Islamic’, this is tucked in some small columns in the middle pages, while Azam Khan or Owaisi get the lime light of front page banner headlines. The secularists are always put on the dock with great amount of vehemence. Immediately after the Malda episode someone wrote an angry mail condemning this writer in the worst possible way, questioning nationalism and funding. The flood of emails from anonymous sources put out choicest abuses against ‘sickularists’. The case of Dadri was clear cut, where the same shouting accusing brigade was justifying the lynching action of the mob for possession of beef as cow is our mother. The pain was that death had been planned, it was horrific, and it was part of an agenda. Dadri cannot be compared to Malda in any way. Though; Malda incident is highly condemnable in forthright manner to begin with. The type of response by the community, where large number of Muslim can be mobilized in the name of insult to Prophet Mohammad or atrocities against Rohingiya Muslim in Myanmar is in a way the expression of pain of the hapless community, globally and locally. The real targeting of the community, the prevalence of Islamophobia has affected the popular perceptions in both the ways. The non Muslims will attribute all the acts of violence to Islam and Muslims while the Muslim community will perceive that injustices are being done against them are there for real. While this type of response is condemnable the underlying insecurity is there for real. One remembers the attacks on Afghanistan and Iraq in particular. In our country one recalls the reckless arrests of Muslim youth in the wake of acts of terror like Makka Masjid (Hyderabad), Malegaon blast, Ajmer and Samjhauta blast. In the wake of Batla house encounter the Muslim youth from different districts of UP were recalled by their parents as Muslim boys came to be treated in a particular way. Similarly the hanging of Yakub Memon drew large number of mourners. It was perceived that they have come to support a terrorist. The other understanding was that in case of Mumbai violence of 92-93 no real punishment to anybody despite over thousand killings. The blasts that followed the violence, so many were hanged and punished. So where is the justice? And so why the hanging of the marginal player involved in the blasts? The Malda violence was not directed against Hindus. It was a general mobilization to protest against the statement against the prophet. It was not directed against Hindus. One recalls that in the wake of Babri demolition angry Muslim youth pelted stones on the police station in Mumbai, this was not against Hindus but directed against the state for failure to protect the Masjid. There is a tendency to project the incident as if Muslims are having this pattern of violence, mobilization followed by indulging in wanton violence. Surely this pattern has repeated number of times. Azad maidan Mumbai and now the Malda-Purnia. Muslim communalism needs to be combated with full amount of firmness in a professional way. Guilty must be punished, no compromise on that. At the same time guilty of all acts of communal violence also need to be brought to book. But if people like Mayaben Kodnani and Babu Bajrangi, undergoing life imprisonment can get bail, where is the justice which can be the base on which our social policies should stand?